Way back in the day, sci-fi used to be about something: specifically, it was a coded way of providing a social critique. HG Wells and other writers who invented the form placed their stories in the future, or created metaphors of strange monsters and aliens, as a way to help their readers escape their present social or economic class, in order to see a present-day issue like poverty or class resentment in a new light. 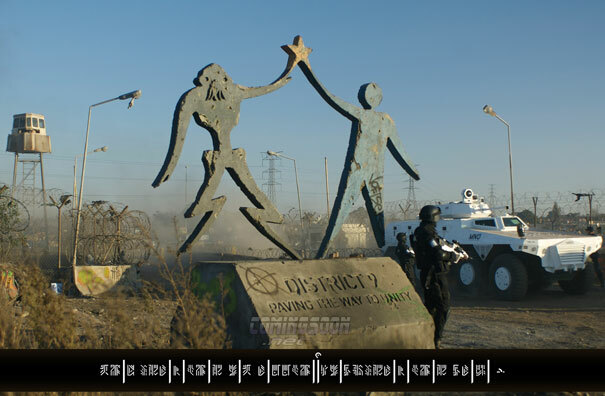 Such is the spirit of District 9, set in Johannesburg and written as a clear metaphor for apartheid. The movie has sparked some controversy – some who believe its portrayal is racist, others who think it’s merely trivial . Most of these reactions are due to the way the aliens are portrayed: as “digusting” insects who ravage through garbage and seem both disoriented and violent. Then there’s also the portrayal of the society that reacts to them with a mix of fear, revulsion and exploitation. I think it’s a brilliant film intentionally challenging racial assumptions as well as our reception of news, international events, and our own places in society. It certainly is a challenging movie, extremely violent as well as trafficking in stereotypes both cinematical and racial. The movie opens in mockumenatary style, interviewing the factotum of a U.N.-like semi-military aid agency (“NMU”), Mathias, charged with relocating the aliens, vernacularly referred to as “prawns,” from their make-shift camps near Johannesburg to a tent-city well away from civilization. The interviews are conducted with members of the press, academia, and general public; we also get the back story of how the aliens came to Earth, the mystery as to who they are and why they are stranded here, and the somewhat threatening and odd behavior of the aliens in their raggedy camps. That all this has a direct parallel to apartheid is obvious, and the movie doesn’t really get going until Mathias is accidently spayed with some alien gunk. The gunk begins a genetic transformation in Mathias that allows him to operate the advanced alien weaponry (which has been coded only to respond to alien DNA). The DNA transformation from human to alien is a stock sci-fi trope (Star Trek: Next Generation did a nifty episode on this theme), but what elevates this movie are precisely the controversial chances it takes with its racial/alien metaphor. Much like Bruno, District 9 wishes to explode safe assumptions – in this case, racial assumptions - even as it traffics in the same stereotypes it’s examining. The “prawns” are not pleasant – they rummage through trash for their meals, respond to the violence of the MNU with equal violence, and are seemingly addicted to cat food (the alien equivalent of heroin? ), for which they trade technology, weapons, and stolen goods on the black market supported by an evil Nigerian gang that rivals MNU for their violence and ferocity. They are also trapped here – unable to restart their spaceship to return home. In this sense they also serve as a metaphor for any displaced people, from Palestinians to Afghani’s, who find themselves dispossessed. The mockumentary treatment helps to reinforce our view of this tragedy as something apart from us, the way world news is something we simply watch on our TV. The movie seems to be saying that in our media saturated environment, even the presence of aliens from another world would soon become just another nightly news story, hardly worthy of disturbing our daily routines. The aliens and their situation have become something we can hardly understand, let alone sympathize with. But when Mathias starts to become a prawn himself, he quickly discovers personally what it’s like to be on the other side of the MNU stick – as well as befriends one of the key prawns, and his son, who equally have to wrestle with their suddenly found allegiance with their former persecutor. At the core of this movie is the alien / human bond, which develops richly over the course of the bloody action, giving the film a strong emotional underpinning which I think is the key to the appeal it’s finding with its fans. I complain often in my reviews about movies that lack a character arc; it’s hard to find a more pronounced arc than the one Mathias must travel, changing in the course of two hours not only his social station and his politics, but his species as well. Mathias’s change is met with an equal growth on the part of his prawn ally, who is able to discover a bond of friendship that goes beyond worlds. It’s a classic story of war and oppression, only the alien DNA and weaponry give it a unique kick, and the documentary style ads the right measure of curious distance and subtle, sarcastic humor. There certainly is some truth to the criticisms about the movie. The Nigerian bad-guys are right out of central casting, and couldn’t be a more offensive stereotype. As are the white military commanders and the bloodthirsty CEO’s. There’s no subtlety lost on this film. But for a sci-fi that’s mean to entertain, District 9 does so in the best fashion. Like the great episodes of Battlestar Galactica or the sci-fi classics of an earlier generation, it asks us to re-look at our present sociology with the strange orientation offered by an alien culture. It does so originally and with spirited gusto, and for those who love a classic sci-fi yarn told well, it doesn't disappoint.